Jason Wieder, 39, and Melanie Rehrig, 33, of Upper Hanover, face hundreds of charges for cruelty to animals. A Montgomery County couple is facing animal cruelty charges after authorities say they neglected several hundred exotic pets — including alligators, snakes, tortoises and guinea pigs — kept at their home in Upper Hanover Township. 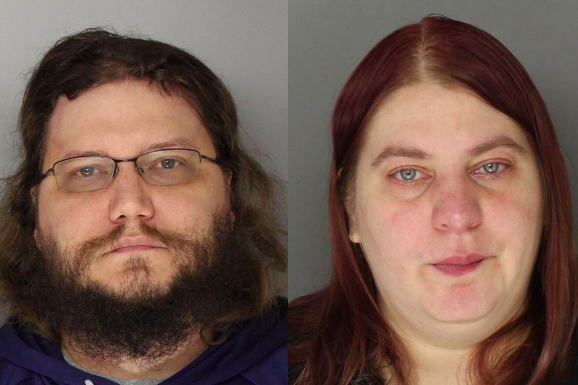 Jason Wieder, 39, and Melanie Rehrig, 33, were arrested earlier this month following an investigation that began in October when a Humane Society police officer received a tip from Lehigh County. The couple were allegedly moving animals to their home in the Palm section of Upper Hanover. A search warrant revealed the couple were keeping 258 creatures in what authorities described as horrendous and unsanitary conditions. Investigators found skunks, frogs and rats among the couple's collection, as well as two endangered southern leopard frogs. Most of the animals allegedly were kept in overcrowded bins without access to food or water. Veterinarians who evaluated the animals found two dead snakes and a third that had to be euthanized. Two guinea pigs and two tortoises were also unable to be rescued, while many other animals suffered from severe dehydration and medical conditions that were left untreated. Wieder and Rehrig face felony counts of aggravated cruelty to animals, neglect of animals, possession of threatened or endangered species without a permit and more than 500 additional misdemeanor counts. Both were released after bail was set at $25,000 unsecured. The couple is barred from possession, ownership or intentional contact with animals.